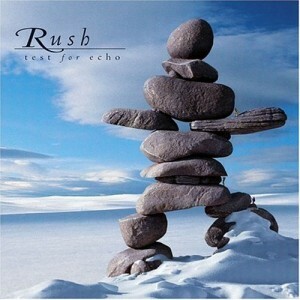 “Test For Echo” may as well be called “The Revenge of Alex Lifeson”. After having his guitar shunted to the side and placed in a secondary role for so much of the Synth Era and during the pop explorations of “Presto” and “Roll The Bones”, it’s easy to tell he was emboldened by the success of the hard-rock leaning “Counterparts”. Every song on “Test For Echo” is loaded with big riffs and centered around Alex’s guitar, with Geddy’s keyboards getting very few, almost token parts on a small handful of songs. Even with the roaring sounds of “Snakes & Arrows” and “Clockwork Angels”, “Test For Echo” may stand as Rush’s heaviest album, coming perhaps the closest they ever have to straight up heavy metal. …Unfortunately, while it’s fun to hear the band playing organically again and jamming with each other, they sadly skimped not only on the lyrics, but the vocal melodies as well. The members of Rush have always been spectacular musicians, but they knew well enough not to skimp on strong song-writing, and could write a memorable vocal hook as easily as an instrumental one. We don’t get much of that here, and most of “Test For Echo” feels like aimless jamming, not songs. The album starts off strong enough though, setting up some great atmosphere with the opening title track. In a switch-up, the choruses are quiet and ominous, while the verses are balls-to-the-wall and lay the riffs on heavy. The lyrics actually have some wry social commentary, talking frankly about how violence and misery in the TV news is presented as entertainment. While Alex easily dominates on “Test For Echo”, Geddy isn’t out the game just yet either. Putting away the keyboards (for the most part) allows him to re-up on his spectacular bass playing, and the solo he has on “Driven” has been a prominent showcase for him for years. The lyrics are like a more base-level, adrenaline charged version of “Red Barchetta”. It goes more for the gut and is less eloquent. Still, it’s one of my favorites from this album. If things had gone in the direction the first two tracks had, I’d probably be rating this album higher. “Half The World” is literally halfway between acoustic and electric guitar on Alex’s part, with a mandola solo thrown in during the bridge (a nice change of pace and something that would reoccur after this). This is the first songs where the lyrics really disappoint though, sounded like a half-thought protest song trying to say something deep about the human condition but misses the mark. Neil’s lyrics not being as well-written and verbose as they usually are is a major flaw I keep coming back to in my criticisms of this album. Geddy’s not off the hook with his singing, though. Oh his voice in fine form, make no mistake. But on record is feels very dry, with little layering. On songs like “The Color of Right”, this makes his performances seem flat, even though he’s on pitch just fine. The riffs on “Time And Motion” hit hard right out of the gate, going back to my theory that this was the closest Rush ever got to heavy metal. The spartan lyrics and vocals aren’t as bad here, but it still makes the track feel like a bunch of random sections randomly collected together without cohesion, not a proper song. “Totem” has a stronger folk basis within the hard rock, but it’s the first song with lyrics by Neil where I have no clue what the hell he’s trying to get at. Most Rush songs I can pick apart the themes and messages he’s trying to convey, but this one just straight up loses me. Best I can suppose is someone picking and choosing their favorite bits from the religions and faiths of the world, but there’s no overarching message and conflicts with Neil’s more humanist approach on previous records. All of this comes to a head on “Dog Years” where the lyrics become just embarrassing, and chorus is one of Rush’s flattest. The guitar isn’t too bad, bordering on punk rock at the beginning. That’s not enough to save it though, making this easily the weakest song on the record. It almost gets worse on “Virtuality”, Rush’s now extremely dated song about the internet. As I’ve said before, I like Rush’s songs about science-fiction except when they blatantly write about sci-fi. This one includes a double whammy of capitalizing on a pop culture phenomenon in a really awkward way. “The internet’s big! Let’s write about that!”. It’s only outdone by “Dog Years” in terms of awfulness on this record. Thankfully things get better on “Resist”, one of Rush’s most lush and tender ballads. This is the only song where Geddy’s keyboards take prominence (in the form of bright grand pianos), doubled by Neil on hammered dulcimer. Alex’s guitar soars during the chorus, and the lyrics get back to the strong themes of individuals standing up for themselves. “Resist” would have the longest life after this album came out and the supporting tour was over, albeit in a stripped down acoustic form I felt made the words more profound. After the dreck of “Dog Years” and “Virtuality”, this song is a lifesaver. We then segue into “Limbo”, perhaps Rush’s weirdest instrumental. Geddy’s bright keyboards add a haunting tone, and here is voice is used as an instrument in itself, rather than singing proper lyrics. It’s a breath of fresh air on this album, but it’s still probably my least favorite Rush instrumental. I wish I had more to say about the final song, “Carve Away The Stone”, but I really don’t. “Test For Echo” is so underwhelming and, at times, outright embarrassing it becomes rather exhausting to listen to. It’s easily my least favorite Rush record, and easily the one I play the least. I’m happy the band was moving back to hard rock, but on this album they did it at the cost of Neil’s eloquent lyrics and Geddy’s spectacular voice. And I feel this really does the band a disservice, because they’ve shown numerous times they can deliver those two things just as well and not just show off their playing skills as musicians.